Congratulations to Holliday Middle School students Aidan Bishop and Julia Garrison. 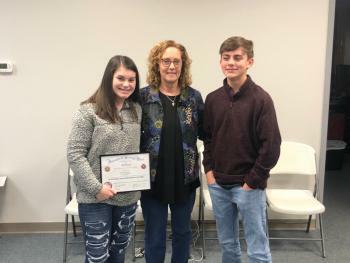 They placed 1st and 2nd in the VFW Patriot's Pen Contest. Their topic was "Why I Honor the American Flag". Aidan's entry has been sent to the District 15 chapter for further judging and competition. Should he win there it will move to the state level. Mrs. Lewis is their sponsor.